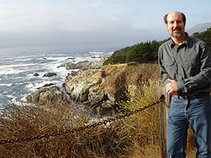 When I attended David Sibley's book signing last year, he said that he looks at shape and listens to songs more than spotting marks and plumage in identifying birds. Sibley and many skilled birders do not have to get long close looks at birds to know what they are. With years of experience, they just know because of bird songs, behaviors, habitats, size, and shape. They often do not even have to see the birds. New birders may have trouble naming species unless the birds sit still in full view, which they rarely do so. 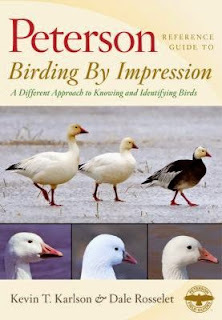 Luckily, novices may learn about expert ID methods by reading the new book Birding by Impression: A Different Approach to Knowing and Identifying Birds by Kevin T. Karlson and Dale Rosselet. In this Peterson Reference Guide, the authors group similar birds and then explain size and shape differences, as well as where to find the birds and important plumage. The new birder then needs much book and field study beyond the book, but a foundation can be laid. The authors include many illustration, some in quizzes that are fun to take. I scored well on heron-like birds, woodpeckers, jays, and even sparrows. I was weak on shorebirds, flycatchers, and warblers. Birding by Impression is an excellent choice for public library collections. Birders might like having personal copies, too. Karlson, Kevin T. and Dale Rosselet. Birding by Impression: A Different Approach to Knowing and Identifying Birds. Houghton Mifflin Harcourt, 2015. 286p. 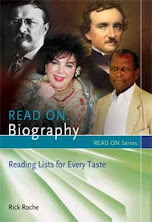 ISBN 9780547195780.